Step 1 Heat the oven to 325 degrees and position a rack in the center of the oven. Line 3 large, rimmed baking sheets with parchment. Step 2 In the bowl of a stand mixer using a paddle attachment, or in a large bowl using a hand mixer, beat the butter until smooth. Add the sugar and salt and beat until well-blended. Beat in the grated orange peel, then the eggs, one at a time. Gently fold in the coconut. Step 3Drop the batter by the tablespoonful onto the prepared baking sheets, spacing each macaroon 1 1/2 inches apart. Bake until golden on the bottom and browned in spots, 25 to 30 minutes. Cool completely on the sheets. Step 4Using a fork, drizzle the melted chocolate over the cooled macaroons. Chill, still on the sheets, until the chocolate is firm, about 30 minutes. In Recipes-list.com we have selected the most viewed recipes from category - Desserts . Enjoy the best recipes specially selected for you! 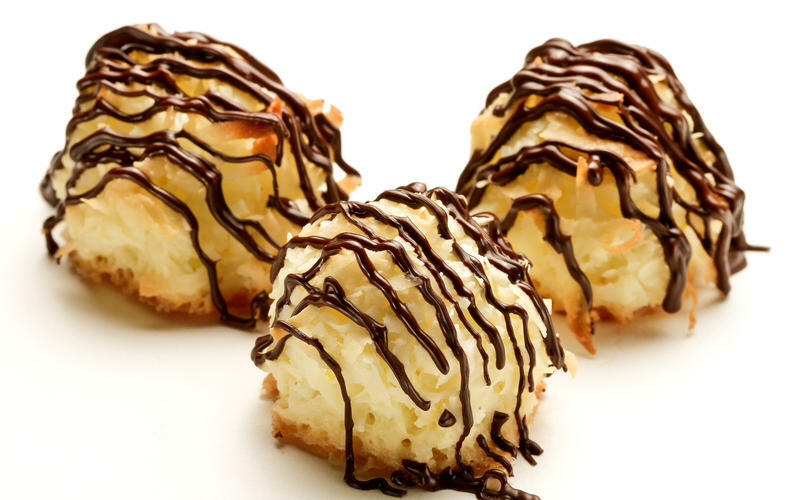 Ambrosia macaroons is the right choice that will satisfy all your claims.